The first Black Clover character to join the fray. 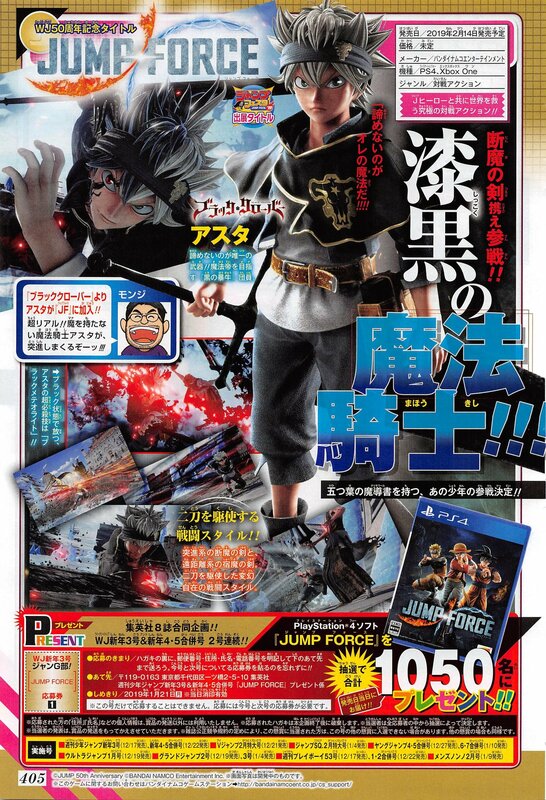 Asta from Black Clover will be playable in Jump Force, the latest issue of Weekly Jump reveals. Asta will fight using two battle swords—his rush-type Demon-Slayer Sword and his ranged-type Demon-Dweller Sword. Update 10/14/18 at 7:25 a.m.: Bandai Namco has tweeted the first, square-cropped screenshots of Asta in Jump Force. Asta, the hyperactive Magic Knight from #BlackClover joins the JUMP FORCE team. Feel the power of his anti-magic dual demon-swords and switch to his Black form to unleash the dreadful ultimate Black Meteorite! Update 12/14/18 at 4:23 p.m.: View the first non-cropped screenshots here.